Wheatgrass is made from the young shoots of the common wheat plant, which are cut during the peak growth period when nutrient levels are at their maximum. The potential health benefits of wheatgrass were first investigated in the 1930s by an agricultural chemist Dr. Charles Schnaber, who noted while researching ways to improve fertility and growth in chickens that free ranging hens would seek out and eat young shoots of cereal grasses. After adding dried wheatgrass to the animal feed, Schnaber saw an increase in egg production and faster recovery from illness, and further tests suggested that the nutritional profile of wheatgrass could meet all dietary requirements providing an array of essential vitamins, minerals, protein, antioxidants and fatty acids. Later in the 1950s Anne Wigmore, a pioneering nutritionist and founder of the Hippocrates Health Institute, further publicised the effectiveness of wheatgrass as a nutrient rich supplement after she developed a wheatgrass based raw diet to treat herself when she contracted colonic cancer. She attributed her recovery within a year to the healing properties of wheatgrass which was a key component of her raw food diet and living food healing programme. Since then wheatgrass has become a popular ingredient in detoxing regimes, and anecdotal evidence suggests it can help to eliminate toxins from the body as well as alleviating symptoms of a number of ailments associated with a weakened immune system. It is advised when following this detoxing programme that in addition to eating only seeds, grains, raw greens and wheatgrass, people should avoid all over-processed foods and chemicals as they are believed to be responsible for cell toxaemia, the root cause of all ailments and diseases. 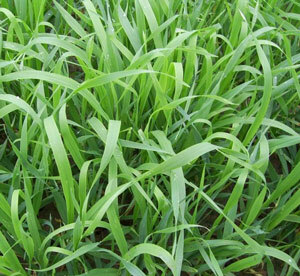 Our organic wheatgrass is grown outside where it benefits from natural sunlight and nutrient rich organic soil. The water used to irrigate the fields is extracted from deep below the ground and guaranteed free from fertilizers and pesticides. The wheatgrass seed is propagated on the farm and planted in the November of each year, then allowed to grow for approximately 150 days before harvesting the following spring. The young wheatgrass seedlings are cut by hand and carefully cleaned 9 times, and only the finest quality blades selected for processing. These are dried thoroughly before using freezing air to crush them into a fine powder. The entire process from field to finished product takes less than an hour to ensure that the nutrients found in the fresh grass are preserved. By growing outside in natural sunlight on fertile soil, our organic wheatgrass is able to assimilate minerals and nutrients extracted from the ground, and the simple sugars stored in the leaves can be converted into complex carbohydrates which release energy more slowly when digested. 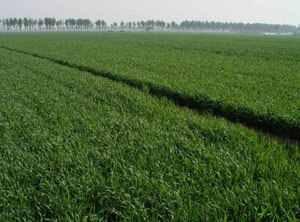 After jointing the nutrient stores are diverted from the leaves towards reproduction and producing grain, so it is crucial that the wheatgrass is harvested within this short window in development. In the period after jointing the pliant young leaf blades are replaced by tough cellulose fibres which give the mature wheat plant structure, and this increase in cellulose synthesis corresponds to a sharp drop in chlorophyll levels as the photosynthetic activity of the plant declines. Wheatgrass is a rich source of chlorophyll, the photosynthetic pigment which plants use to create energy using carbon dioxide and sunlight. Chlorophyll has been demonstrated to have antioxidant effects when included in the diet, preventing the formation of free radicals which damage healthy cells leading to cancer. Wheatgrass is also high in fibre which aids digestion and cleanses the colon, and regular wheatgrass consumption has been linked to lower rates of colon cancer. With a high protein content of 13%, wheatgrass provides the body with amino acids needed for growth and repair, and is also a source of iron required to make healthy red blood cells able to transport oxygen around the body. Wheatgrass is also high in vitamins C and E, both natural antioxidants which can help prevent cellular damage and delay the ageing process, and the essential fatty acids omegas 3, 6 and 9, which can help prevent heart diseases.